Fixed Priced Drain Unblocking Service. 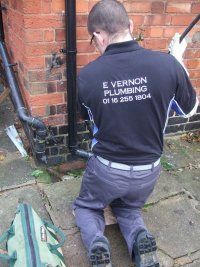 Access into the pipework that is blocked, so for Underground Drains usually inspection cover, Man Hole Cover etc. If you are unsure about the specific details of your problem, don't worry, just call and we will happily discuss your problem. For Commercial Premesis please call for a quote as drainage systems vary dependant on the type of building/business. We Do Unblock Drains Leicester Comercial Premesis. Low Set Prices - We opperate Locally, not Nationally, keeping our running costs down, we also charge a set price rather than an hourly rate. This gives you peace of mind. Rapid Response - We understand how problematic a blocked drain can be, and again we are Local, not National, so we are never far away. Guaranteed Results - We Guarantee that the blockage is completely gone, and should we ever make a mistake and it has not gone, then we would come back again within 30 days for free. And Finally - Our Drainage Van is Signwritten more discreetly than some of our competitors who like to turn up in a Bright Orange Van who want to tell the whole neighbourhood that you have a blocked loo!